According to the World Health Organization (WHO), patient safety is a “global imperative,” affecting both patients and healthcare professionals worldwide. In India, the Patient Safety in Dentistry taskforce was created in 2009, with myself as the coordinator. The six members are committed to the development of systems, organizations, policies, and procedures to ensure safety throughout treatment. For example, the occupational use of sharps routinely exposes dental professionals to blood-borne viruses, such as AIDS, hepatitis B, and hepatitis C. These serious, potentially life-threatening diseases are transmissible to healthcare professionals from infected patients—and from infected caregivers to patients. WHO reports an estimated 70,000 hepatitis B infections in healthcare workers from contaminated sharps annually. In India, a large proportion of the population is infected with blood-borne diseases: the country has an intermediate endemic of hepatitis B, with hepatitis B surface antigen (HBsAg) prevalence between 2% and 7% among the groups studied. The number of HBsAg carriers in India has been estimated to be more than 40 million. Although exposure to these and other viruses can be minimized by strict adherence to safety precautions, the risk cannot be completely eliminated. Therefore, in order to help prevent disease transmission, it is essential that dental healthcare professionals, auxiliaries, and students be vaccinated. Unfortunately, vaccinations for HIV and hepatitis C virus are not available; however, a hepatitis-B vaccine has been administered since 2002 in many parts of India through the National Immunization Program. Despite this effort, the country still has a significant problem: an estimated every 20th Indian is a carrier of hepatitis B virus. In many countries, it is mandatory for healthcare workers and students to be immunized against hepatitis B. India is home to 290 dental colleges, admitting more than 21,000 students every year. Therefore, to protect our flourishing dental workforce from occupational exposure to hepatitis B, it is important that immediate steps be taken: specifically, immunization for dental students who do not demonstrate active immunity against hepatitis B. Students having no or inadequate immunization at the time of admission would be required to be immunized, and each educational institution would maintain immunization records of all students. This is only the beginning of what may be achieved for patient safety in India. Every practicing dental healthcare professional is encouraged to pursue available continuing dental education (CDE) in patient safety procedures. In addition, the World Health Organization will be releasing a Multi-Professional Patient Safety Curriculum Guide as a result of a 2-week virtual global discussion forum. Dental schools in India will be encouraged to incorporate this updated curriculum when it becomes available. 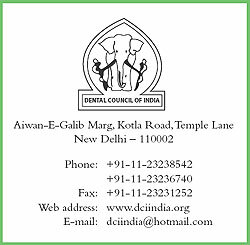 The Dental Council of India has long been engaged in protecting the well-being of our healthcare workers and their patients. Through safety education and policy, we will continue to remain at the forefront of global healthcare initiatives.